We will come out to visit you and your horse at your barn, it is important that the horse is clean and you are ready to ride. We will complete an evaluation of your horse to check for any soreness and anything that may affect the fit of the saddle. 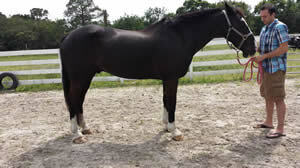 We take both a static and dynamic evaluation of your horse to check for any muscle restriction or characteristics caused by the fit of your horses current saddle. At this point we will check over your saddle, ensure that the tree is still in good shape and check the balance and structure of your saddle as well as assessing the panels. 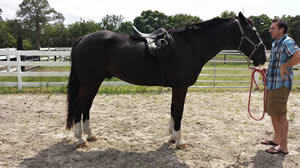 Then assess the static fit of the saddle on your horse, you will then be required to ride in your current saddle,we will be assessing your saddle as you ride in it. Once this is complete we will be able to provide you with an honest and accurate assessment as to how your saddle fits and what can be done to make it fit better, we can adjust the flocking on site and will then ask you to ride again to ensure that it is fitting well. If your saddle is foam or cair then she will be able to suggest ways to ensure the best fit through the use of shims and pads or if this is not an option suggest a conversion to wool. If your saddle simply does not fit well, then we can suggest the style, type and Brand of saddle that would work for your horse. Louise and Chelsea are independant so we have no brand bias so can help you accurately find the right saddle and help guide you through that process. 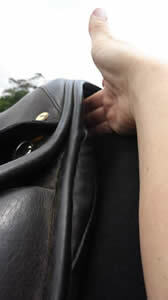 This side view picture is useful to show back contour and wither. 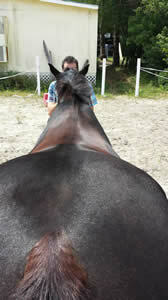 As you can see from this picture this horse has a high wither, with wither pockets and rises to the croup. Please note that he is standing perfectly square and his head is held at a natural position. On the left picture this picture displays the balance of his current saddle. 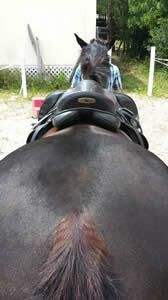 When we come to assess your saddle fit, please be prepared to ride and have your horse ready and clean. I will take history for both you and your horse, conduct a symmetry and palpation evaluation, evaluate movement , take tracings, check the saddle over, conduct a static, dynamic and ridden evaluation. This fee applies for flocking to saddle, then I will evaluate the fit once again with the rider up and adjust flocking again if need be. Evaluation and On-site Flocking as detailed above. The Saddle needs to be taken to my workshop to be completed. I aim to do this and have the saddle back to you within 7 days. The Saddle needs to be taken to my workshop to be completed.